We understand that people do not want the trouble of handling an insurance claim. Let HUF Construction guide you through every step of the claims process. We will take care of everything from start to finish. We conduct a FREE property inspection to assess storm damage. If there is enough damage, call your insurance company and file a claim. We will meet the adjuster from your insurance company to ensure all damage is documented and included in their report. Once the claim is approved, we will work with your insurance company to reach a fair price for the repairs. We will perform the repairs based on the insurance estimate. Your only expense is your deductible. We will bill your insurance company when the work is complete to get the remaining funds released to you. 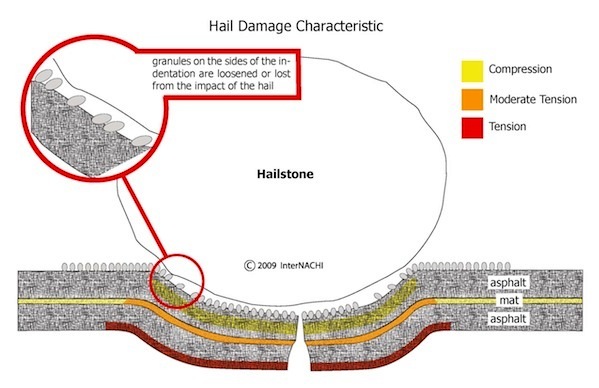 Most hail damage cannot be seen from the ground and requires a rooftop inspection. After hail impacts the shingle, a bruise is made in the shingle mat and granules are displaced. With the granules removed, the mat is exposed to the elements. The weathering and eroding that follows compromises the shingle and its ability to keep your home dry. You may not see evidence of the immediately because your roof may not leak for months after it has been damaged. Most insurance companies only allow a 12-month timeframe to file a claim after a storm. Don't wait until your roof leaks...it could be too late!